Here's a short Box jelly fish update in July 2017. 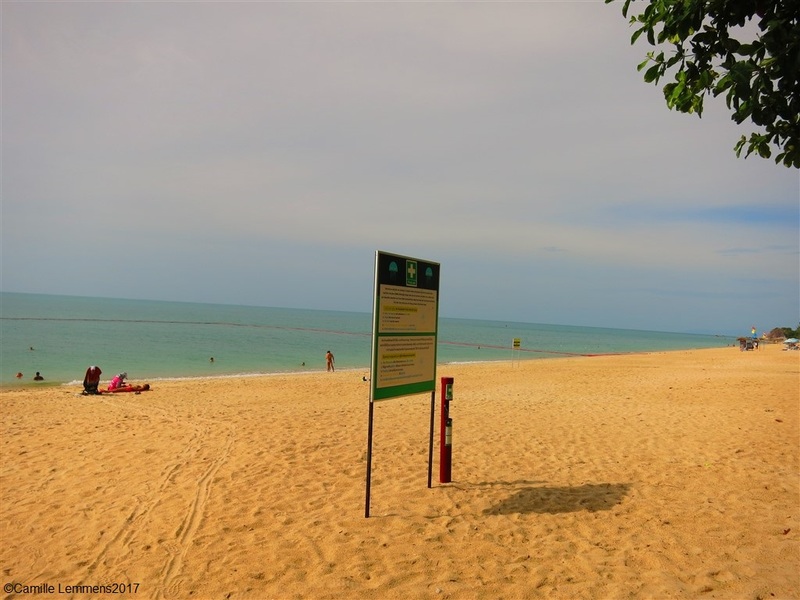 The most interesting news is that two stinger protection nets have been placed at two different beaches on Koh Samui. 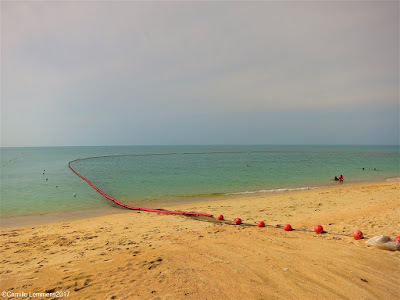 One net has been placed in front of Lamai Wanta Beach Resort at Lamai beach. 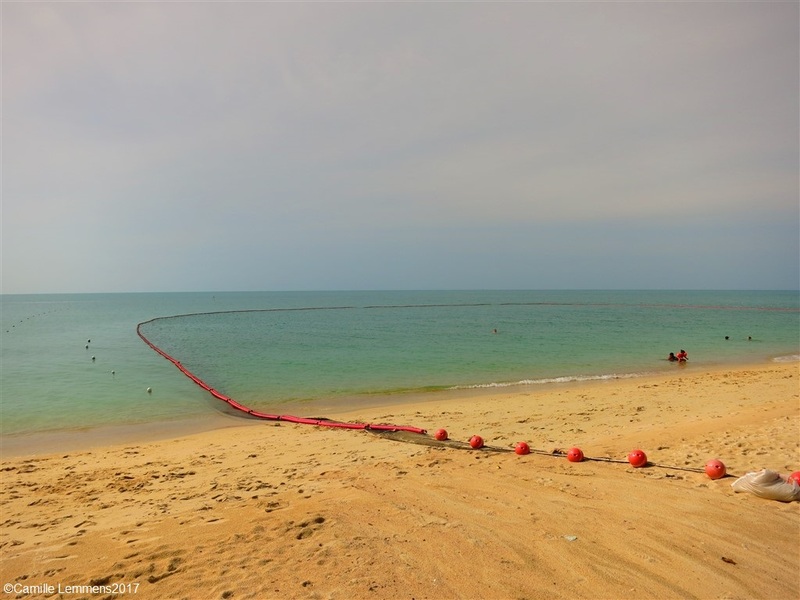 The other net has been placed in front of Ozo at Chaweng beach. This is a great start and I can only hope that this initiative will be followed by plenty of other hotels around the island. Providing the nets will be well maintained and checked on a regular base, they should give real good protection against box jelly fish encounters and incidents. Other great news is that over the last two weeks, a well known box jelly fish researcher has visited Koh Samui, for the second time. Meet Angel Yanagihara from Hawaii in the USA. She is a PhD research professor and trained as a biochemist. She has conducted and completed research relating to box jelly fish in various parts around the world over the last twenty or so years. 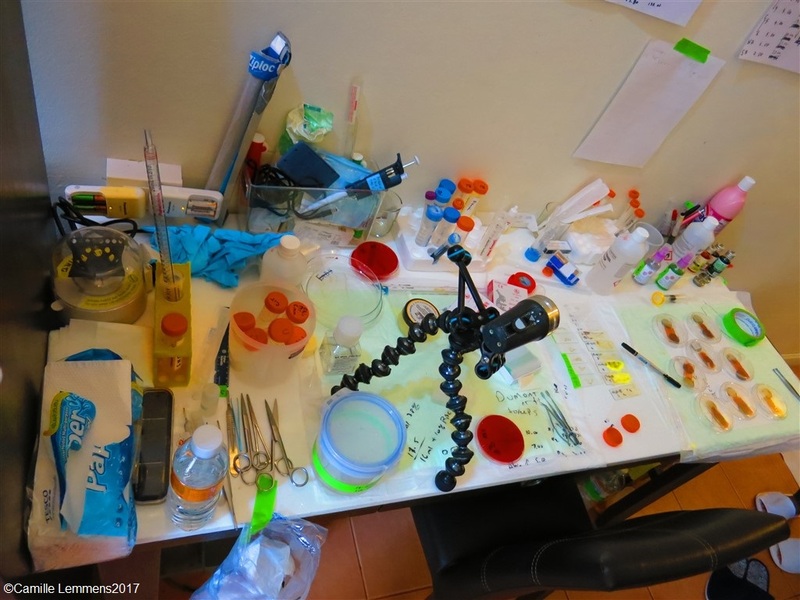 This time she came to Samui as an invited expert to provide training in field ecology approaches and direct activity assays to Thai and other international partners. This is the second time she visits the Koh Samui archipelago and this time around she had a very successful visit. 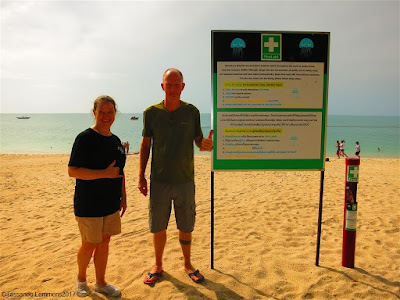 Angel and her team caught a 'Morbakka' box jelly fish at Koh Tao and at Lamai beach she caught a potentially deadly 'Chironex' species of box jelly fish, the species that could well have been injuring people over the last few years around Koh Samui and Koh Phangan. 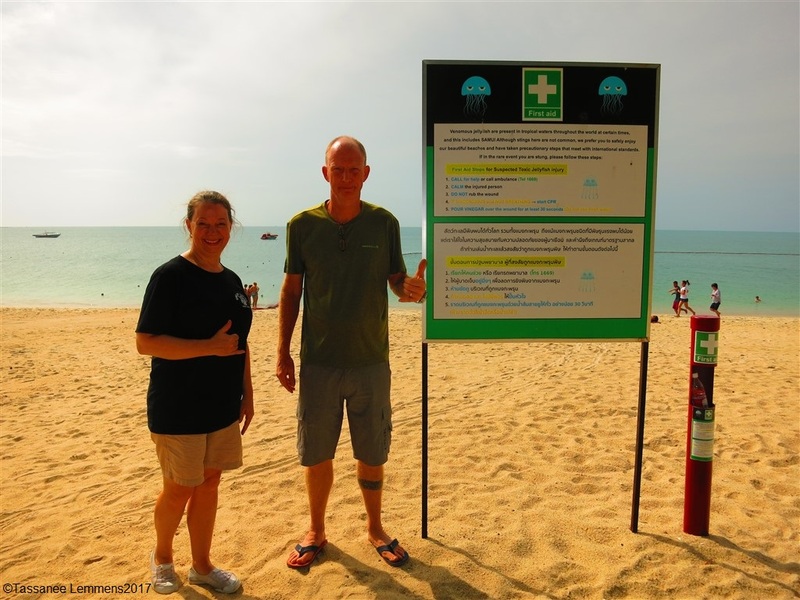 Box jelly fish update in July 2017; A life guard station near Lamai Wanta Beach Resort. Unfortunately this initiative that seemed to have started out so well, has not gone very far. The station on the picture seems to be never staffed. Especially now in high season and potentially with a high concentration of box jelly fish around, there should be more posts and staff to man them. The box jelly fish season is about to heat up with many known and registered incidents happening between July-August until roughly October over the last couple of years. This can be caused due to the life span and life cycle of the 'Chironex' box jelly fish around Koh Samui waters. Proof of box jelly fish already being around is the adult 'Chironex' box jelly fish species that Angel caught last week at Lamai beach. Incidents have also been reported and registered outside of this period but the mentioned period between July and October does see an increase in incidents. For me, as a self educated, local box jelly fish interested person, it was a great opportunity to meet up with Angel and get to hear some details about her various research programs. We met the day before she was about to leave back to Hawaii. Due to my busy travel plans, I'm glad we were able to meet at all. Hopefully she will find funding to return to Thailand and assist in the box jelly fish prevention programs and projects around Thailand. Although progress has been made, a lot of improvement and awareness can still be achieved. Box jelly fish update in July 2017; Angel's mobile laboratory in her room. On the door was a sign in Thai, stating that at no time at all staff should enter the room! The Thai government doesn't seem to want to hide the presence and issues of box jelly fish in Thai waters, now it's time to expand on this and get more projects off the ground. It's an ongoing process! For all the beach lovers, during the mentioned period of July through to October, be careful when you enter the water, ideally wear stinger suits or swim in roped off areas. On a separate note, as added as an extra comment by Angel; vinegar is an essential first aid step to prevent additional nemaotcyst discharge and venom injection but it is not an authentic "treatment " in that it does not enter the blood stream, remove venom or inactivate the venom injected. Heat does authentically reduce venom activity and as such is an actual treatment. 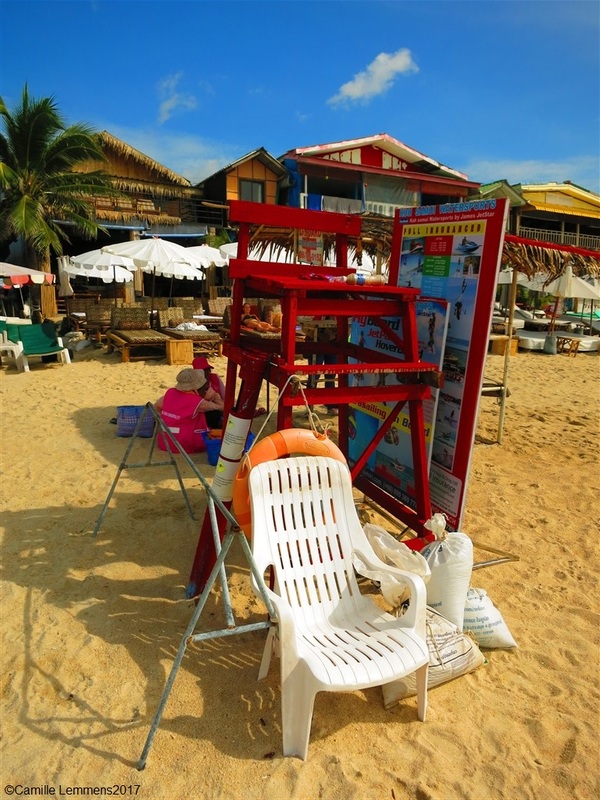 45C for 45 min reduced the Samui Chironex venom activity by over 90%. Ice made it worse than room temp treatment. These results are similar to my peer reviewed published findings in Chironex species elsewhere.